This well known and bizarre plant that you can find in many places in Crete, is native to the East Mediterranean, from Greece, the Balkans, all the way to SW-Turkey. (Reports from Italy are possibly from introduced plants; material from Spain and North Africa almost certainly represents introductions). Dracunculus vulgaris Schott (1832) is the most spectacular of the European aroids. It belongs to the Araceae and is related to the well-known Arum. 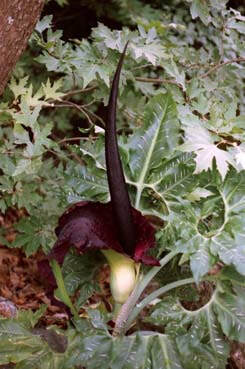 Dracunculus vulgaris is generally called Dragon Arum, Voodoo Lily, Dragonwort, or Stink(y) Lily. 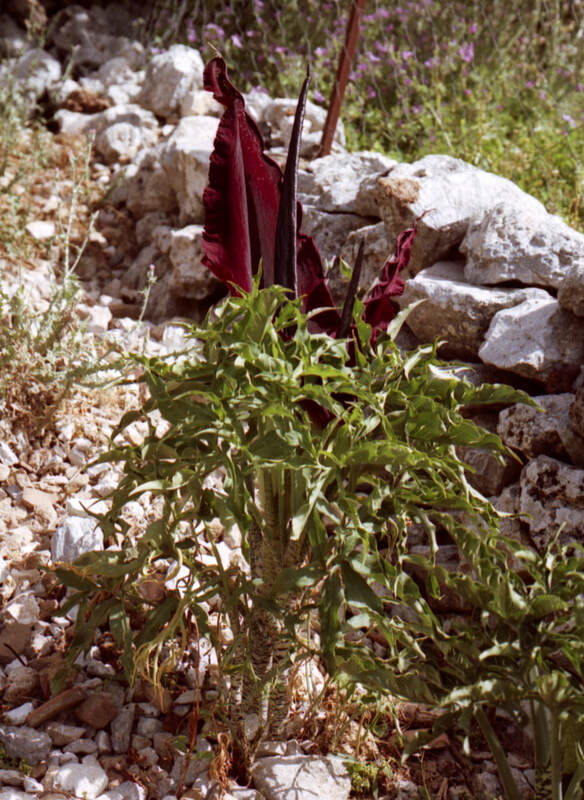 In Greece it is called Drakondia.Like all Araceae, it prefers fertile moist soil and can be found in undisturbed olive groves and waste land. I found numerous plants in the gorge of Theriso. The foliage is very attractive. The stalks (actually pseudostems), which have only as few as two to four large leaves on the top, make the plants already very pretty. The plant is a rather robust, solitairy (seldom a clump-forming) herb, sometimes up to 2 m high. The pseudostems are a half to more than one-and-a-half meter long, pale to light-grey-green with numerous jagged dark purple to almost black markings, stout and capable of supporting an inflorescence of over one meter in length without the need for additional support. The leaf lamina are reniform in outline, pedate, with the mid-lobes larger than the posterior lobes, at the top ending with a little curl. The leaves can be up to 45 cm, bright mid- to deep green, with 7 to 19 (or even more) elliptical leaflets, many times with streaks or markings, that are shiny, nearly transparent windows. 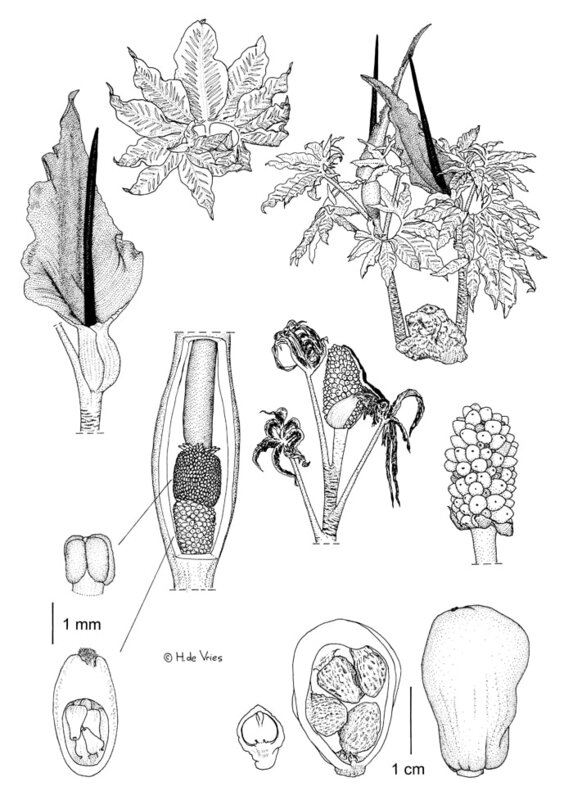 The leaves normally die back during blooming (see drawing of Dracunculus vulgaris below). But the beauty at this stage barely hints of the amazement that is still to come: as the inflorescence unfolds, it reveals a long, black appendage from the center, known as the spadix, which can reach a total length of 135 cm (!!!) 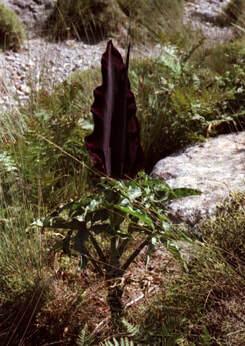 enveloped by a large very deep purple-black bract, the spathe, which can reach a total length of 125 cm (!!!). What looks like one flower is in reality an inflorescence of a spadix, bearing numerous flowers. In most plants the inflorescence is not longer than 40 or 50 cm – still impressive enough! The actual flowers - both male and female - are hidden deep inside the spathe, which features a bulbous chamber. The striking beauty of this plant can be a little shocking: like many Araceae the mature inflorescence spreads a nauseous dungy rotten meaty odor. The nasty smell of rotting meat is designed to attract flies for pollination. Fortunately the smell usually lasts for only one day. The potential pollinators (mostly colorful shiny carrion flies, but Staphylinid and Scarabidinid beetles have also been reported) enter the spathe tube and gain access to the flowers by descending the spadix appendix. There are two sets of flowers, female at the bottom and male above; the topmost flowers are sterile and modified into a kind of thorn. The pistillate flowers are arranged in a band and ringshape zone, the ovary is oblongiform (about 4 mm), with a few (I found in every ovary 4 or 5) ovules on an apical and a basal placenta, cream to yellow green, there is no clear style but the stylar region is a little purple, with a papillate stigma. The male and female flowers are separated by a brief naked or pistillode-bearing interstice; the staminate flowers too are arranged in an a band and ringshape zone, the anthers (1 to 2 mm) are dark yellow, their filaments very short, the connective is exceeding the loculi, the anthers are dehiscing via tiny discrete apical pores and the pollen are released in strands. Flies attracted by the smell slide down the smooth surface of the spathe, and they become trapped for a day, not by hairs or bristles like in many other Araceae, but by the smooth surface that prevents them from climbing upwards. During this time they crawl over the stigmas, dusting them with pollen from earlier traps. In the next days the anthers of the male flowers dehisce, the spathe withers, and the flies are freed to visit another inflorescence and continue their role of pollinators. 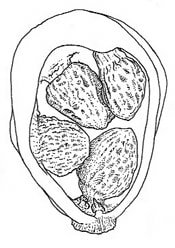 The infructescence is comprised of about 60-80 berries (with only a few seeds inside each berry (see drawing)), sometimes partially encased in the dry spathe tube remnants; the berries are upside-down-pear-shaped, 1 to 3 cm long, orange-red when ripe. The Seeds are compressed globose, 3-4 mm, grey-brown, somewhat laterally compressed and angled,with a rugose testa. In the Kamares region of central Crete ‘white’ Dracunculus are found, together with the normal plants with purple-black inflorescence. 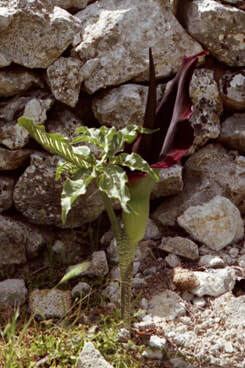 Since the first reports in the early 1970s a number of other forms have been found in the same area with variously marbled purple and white spathes and pale lilac to deep purple spadix appendices. (from Çanakkale in northwestern Turkey two cases of D. vulgaris with a white-haired spathe and spadix appendix are reported; one with prominent, very short hairs, the other with a similar but sparser indumentum). It should be noticed however that Dracunculus vulgaris displays much variation in overall size, degree of leaf division and leaf marking. They spread by self-seeding and by bulb offsets. The seedheads will eventually fall down and be carried away by water and (with soil) by men, spreading the Dragon Arum more distantly. It is a poisonous plant that animals do not approach. ​The illustrations on this website are copyright protected.